Stock photo of the nose an the propeller of an Air Tractor AT-802 aircraft in Red Lake, Ontario, Canada. 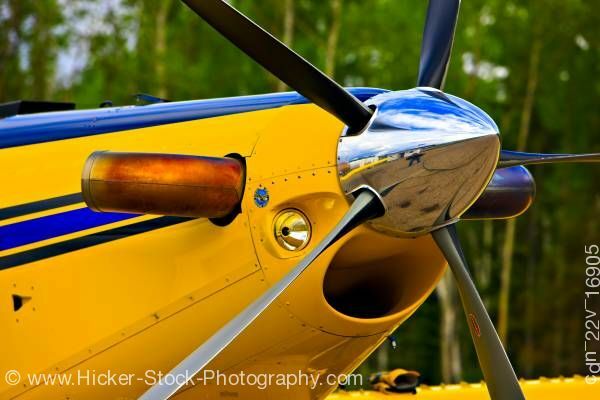 This stock photo includes the nose and propeller of an Air Tractor, AT-802 (modified for bulk fuel hauling - capacity of 4,000 litres), Red Lake, Ontario, Canada. The AT-802/802A is the world's largest single engine aircraft, and its popularity reflects the industry's trend to larger, high-production turbine equipment. With a payload of 9,500 lbs, the AT-802A provides more working capacity than any other single-engine ag plane. Its power, speed and payload delivers large operation efficiencies and opens up new income opportunities.